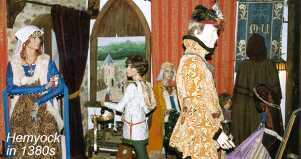 Young, orphaned heiress who married and supported the courtier appointed to pacify rebellious West Country lords; including by building Hemyock Castle. Margaret was the great grand daughter of Margaret Hidon / Hydon. She was born in 1347 at Hemyock Castle. Her mother was Joan de Brienne (the daughter of Sir Guy de Brienne of Slapton) and her father was Sir Oliver Dynham of Hemyock. Margaret&apos;s father died when she was 4 years old. She had an older brother, Oliver (b. 1344 ), & 2 younger sisters Ellen & Joan ( b. 1349 & 1350). As all three of her siblings died young, she became her father&apos;s heir. Margaret grew-up under the protection of her maternal grandfather, Sir Guy de Brienne, a powerful Baron who is buried in Tewkesbury Abbey near the Despensers (favourites of Edward II). Sir Guy had married the widow of the Despenser son when her Despenser husband and father-in-law were "hanged, drawn and quartered" following the rebellion against Edward II. Sir Guy de Brienne fought in Northern France with King Edward III and the Black Prince, and was a Royal Standard Bearer. Margaret&apos;s father also fought in these wars and was knighted at the Capitulation of Calais in 1348 following the terrible 2 year Siege of Calais. Margaret was the heiress to Hemyock and her father&apos;s other manors. Her grandfather married her to Sir William Asthorpe, presumably with royal approval, in 1362 when she was just 15 years old. (See leaflet for full details of the "Proof of Age"). Sir William and Lady Margaret Asthorpe appear to have made Hemyock Castle their main home. These were dangerous times: Edward III died in 1377; His son the Black Prince had already died in France a year earlier, so his young son Richard II gained the throne. This was during the ghastly Hundreds Year War with France. The barons were fighting amongst themselves for power and influence. Worse, many people favoured John of Gaunt as Regent, and then his son Henry Bolingbroke (later Henry IV) as king. There had been outbreaks of Black Death / Plague, to be followed by the 1381 Peasants&apos; Revolt. In 1380, King Richard II granted Sir William and Lady Margaret Asthorpe a Licence to Crenellate (Medieval Castle Building Permission), allowing them to strengthen their already fortified Hemyock manor house, turning it into a castle. This may well have been granted so that Sir William could counter the power of the Earls of Devon: Sir William Asthorpe, unlike the Earls of Devon, was loyal to the boy king Richard II. In the scene shown above, Sir William and Lady Margaret have just received news of the Licence to Crenellate Hemyock Castle. As they cannot easily read the Norman Latin in which the document is written, their Chaplain is reading it to them. Margaret is sorting through her jewellery, wondering what to sell and worrying how they will pay for the work on Hemyock Castle – a continuing problem even now! Sir William Asthorpe must have been absent frequently on various campaigns. He had several official appointments & duties that took him away from Hemyock, probably leaving Margaret in charge of running their various manors, household and Hemyock Hundred. Thus the various details of his court cases with local authorities (eg. the Abbot of Dunkeswell) are probably due to local rivalries as the fortunes of Richard II waxed and waned. Margaret kept their estates together, administering them during very difficult times, ensuring that the residents survived the various famines, civil wars and outbreaks of Plague. Sir William and Lady Margaret both died during 1399; the same year that King Richard II was deposed by the future King Henry IV and then murdered. Unfortunately they had no surviving children so their manors and estates reverted to the Crown before eventually passing back to Margaret&apos;s father&apos;s family – the Dynhams.